Please be advised that the Josh Groban concert taking place at the Forum on Saturday, Oct. 27 is currently a non-union engagement. 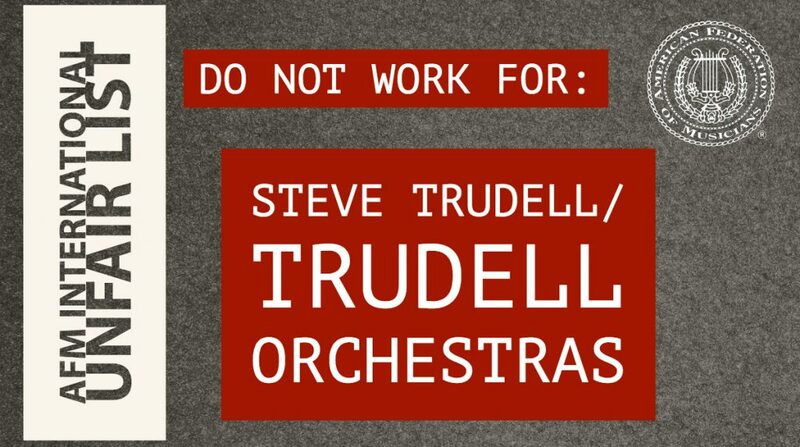 If you are contacted to perform by Steve Trudell/Trudell Orchestras, please be aware that at this time it is a non-union date with no union contract protections. Steve Trudell/Trudell Orchestras is currently on the American Federation of Musicians International Unfair List. AFM members shall not render musical services for organizations, establishments, or people who have been placed on the International Unfair List, or for their principals. Any member who violates this rule shall be subject to penalties in accordance with Article 11, Section 13 of the AFM Bylaws. This entry was posted in All News and tagged afm unfair list, Do Not Work For, Steve Trudell, Trudell Orchestras on October 24, 2018 by admin.